A gentle opening hole measuring 361 yards from the championship tee. This short par 4 requires a positional tee shot and a short iron to the green. The green is relatively level and two shallow bunkers are placed on either side. At 415 yards, this medium length par 4 always seems to play longer than it actually measures. The fairway is obscured from the tee by a ridge running across the hole some 100 yards in front. The fairway is generous and is normally played with a drive and a medium iron. The green is located in front of the historic tower, which is the symbol of Woodhall Spa Golf Club. This is a classic British heathland dogleg par 4. Measuring 414 yards from the championship tee, the aim of the tee shot is to avoid the left hand fairway bunker located some 270 yards from the tee. The ideal shot is to be in the fairway short of this bunker. A medium/short iron is then required to a level green well guarded by deep cavernous bunkers. This hole is the first of the three par 3s on the course. Famous for its extraordinary large deep bunkers this hole measures 148 yards. The green is 38 yards long and quite narrow and surrounded by bunkers at the front and the sides. This is a challenging hole and requires a well-struck shot to find the putting surface. Measuring 526 yards, this is the first of four par 5s on the course. The hole is straight with bunkers down either side of the fairway at strategic points. The carry to the fairway is 225 yards over heather from the championship tee. The fairway also slopes right to left in the landing area so the ideal line is down the right hand side. There is a bunker located on the fairway some 50 yards short of the green. This is an exceptionally well-placed trap and must be avoided, as it is not possible to reach the green from it. The green slopes gently from right to left and is 26 yards long. A long challenging dogleg right par 4, measuring 470 yards from the championship tee, requiring a carry of 225 yards over heather to reach the fairway. The main feature of this hole is the right hand fairway bunker complex on the corner of the dogleg. The second shot is played over a slight rise in the fairway to green guarded by two bunkers on the front left and right. The green slopes gently from right to left and is 33 yards long. This hole is the second of the par 3s and measures 209 yards from championship tee. Normally played into the prevailing wind, the golfer is faced with a challenging tee shot played to an elevated green complex. There are three bunkers on the front left of the green and a large cavernous bunker on the front right. The green is kidney shaped and fairly level, measuring 31 yards in length. This hole, the second of the par 5s, is the longest hole on the course, measuring 584 yards. It is a straight hole with numerous strategically placed bunkers. There is a huge cavernous bunker on the right, waiting to catch an errant tee shot but the most striking feature of the hole is the cross bunker complex. The green is well guarded and an accurate second shot is needed. There is a notable bank on the right hand side of the green, which requires careful consideration when playing to a pin location in this area. A short dog-leg par 4 measuring 338 yards from the championship tee, this hole is a classic example of how a hole does not need to be long to be difficult. From the tee, the aim is to finish in the fairway short of the right hand drive bunker. This will leave a shot of some 80 yards to a well bunkered green. There is a shelf of 10 yards at the front of the green before the surface dips towards the back. This hole is one of the most photographed on the course. 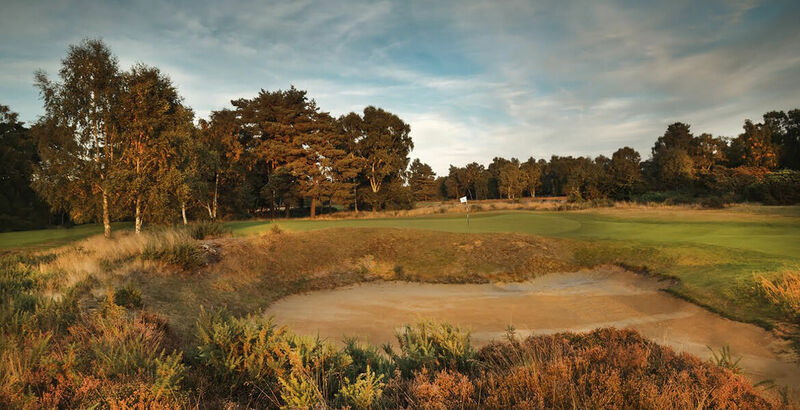 It is a classic heathland par 4 requiring an accurate drive through trees and gorse to a green that is located some 70 yards behind a cross bunker complex. The fairway is wider than it looks and the cross bunkers make the green look closer than it actually is. The green is raised and there are no greenside bunkers. The last of the par 3s, this hole measures 172 yards from the championship tee. This hole has featured in various lists of the world’s best par 3s and is classic in design. The most notable features are the deep greenside bunkers and the one on the left is the deepest on the course, measuring 12 feet below the green. The green is long and narrow and slopes slightly from back to front. The 13th hole completes the ‘Amen Corner’ of the course. It measures 451 yards from the championship tee and is arguably the most difficult drive on the course. Often played into the prevailing wind, this is a very challenging hole particularly with strategically placed drive bunkers on both sides of the fairway. There is a substantial bunker complex in front of the green, which has to be negotiated before the green is found. The green is quite level apart from a small shelf at the back. Measuring 521 yards from the championship tee, the drive is angled across a series of bunkers strategically placed behind one another. The line from this tee is to the left but a more central aim is required from the forward tees. The best feature of this hole is the bunker on the left some 50 yards short of the green. This bunker has to be flown if the green is to be reached in two. The green is fairly level with a pot bunker located at the front right and slopes covered in deep rough featuring at the sides and back. This is the first of three short par 4s, none of which are straightforward. Measuring 321 yards, this hole requires a strategic tee shot that finishes just short of the right hand drive bunkers. From there, a short iron is required to hit a well bunkered basin style green. Measuring 395 yards from the championship tee, this hole requires an accurate tee shot over a 200 yard carry of heather to reach the fairway. Played into the prevailing wind, this hole is challenging and the key is a solid, straight tee shot. The green is relatively level and is not bunkered. At a seemingly easy yardage of 336 yards, this hole has wrecked many good rounds of golf. It is not a driving hole and requires a strategically placed tee shot left of the right hand drive bunker. Even though the second shot is only a short iron to the green, deep pot bunkers await an errant shot. The green slopes from left to right and is 31 yards long. The finishing hole is 540 yards long and is played into the prevailing wind. The tee shot is the most critical and is arguably the second hardest on the course. The further the drive is hit, the wider the fairway becomes and the ideal line is down the left hand side. There is a huge oak tree on the right hand side which blocks out this side of the fairway. There are numerous bunkers on both sides of the fairway, which have to be considered on all shots. This is an excellent finishing hole to a world class course.